Warming across Canada’s Northern landscape since the early 2000’s has resulted in significant changes to all components of the cryosphere, some of which are having regional and global scale impacts on infrastructure and sea-level change. 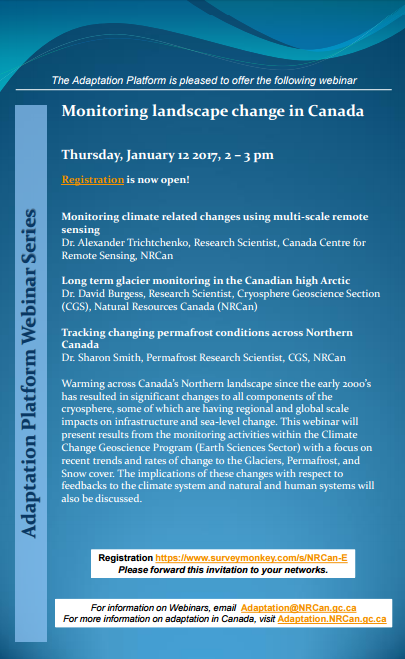 This webinar will present results from the monitoring activities within the Climate Change Geoscience Program (Earth Sciences Sector) with a focus on recent trends and rates of change to the Glaciers, Permafrost, and Snow cover. The implications of these changes with respect to feedbacks to the climate system and natural and human systems will also be discussed.